Spanish scientists have developed a laboratory equivalent to equine skin which will hopefully prove useful in the study of cutaneous diseases in horses. They say it resembles equine skin “morphologically, immunohistochemically and ultrastructurally”. 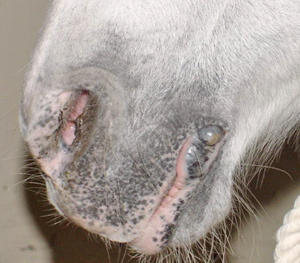 The researchers, from tertiary institutions in Barcelona, say there is increasing interest in the biological and pathological study of equine skin owing to the high prevalence of skin-related diseases in horses. However, knowledge of equine skin cell biology and cultures was limited by the low number of in vitro studies, they said. They described a process in which cultures of pure equine keratinocytes and dermal fibroblasts were obtained by enzymatic digestion of skin biopsies. Fibroblasts were embedded into type I collagen matrices to obtain dermal scaffolds, the surface of which was seeded with keratinocytes. The three-dimensional cultures were then exposed to the air–liquid interface to enable epidermal stratification. They said that, after 14 days in air-exposed conditions, they had successfully developed an equine skin equivalent. It was , they said, the first time an equine skin-equivalent model had been developed in a laboratory.